We are joining forces with Yours and Owls this New Years Eve to present our Bulli beachside warehouse party, Last Dance. Presented in conjunction with FBi Radio and Resident Advisor, Last Dance is your unique and fresh offering for bringing in the New Year. Only one hour south of Sydney, with a lineup of international & local heavyweight artists across two curated stages, Last Dance is not to be missed. Also soundtracking the festivities are international & local heavyweight artists including Mall Grab, Midland (UK), Moxie (UK), Ben Fester, Nite Fleit, Adi Toohey, Parkside DJ’s and Freda & Jackson. Situated only minutes from Bulli Beach, Last Dance is unlike any other New Years celebration on offer. 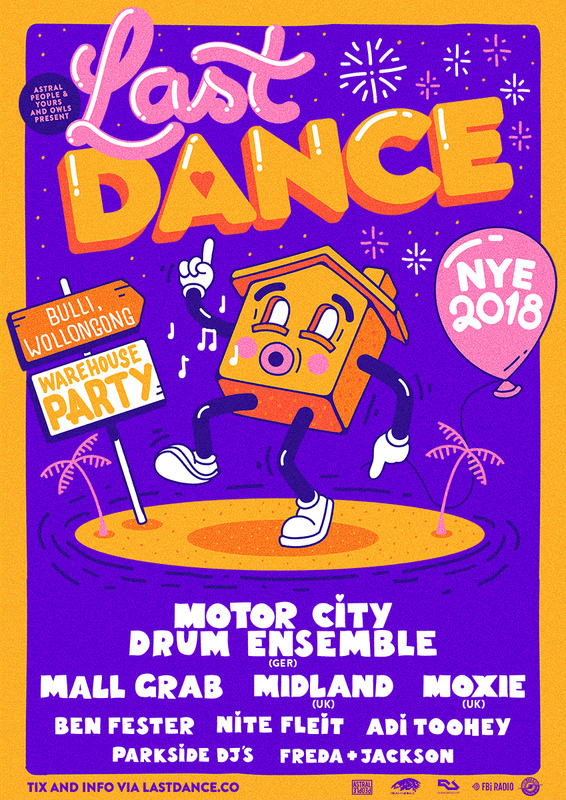 A welcomed alternative to camping festivals and packed-out clubs, and just a short trip down south from Sydney, the warehouse vibe of Last Dance is the perfect middle-ground for a music-fuelled, friend-filled New Years. With early bird tickets already sold out, Last Dance is undoubtedly a sure fire way to start 2019 right.